Mindroutes: OVERCROWDED COVENT GARDEN - DLR TO THE RESCUE? OVERCROWDED COVENT GARDEN - DLR TO THE RESCUE? Covent Garden tube station, on the Piccadilly Line, is amongst the last of central London's stations with lift/stairs access only. ie. escalators have not been installed. To do so would be very difficult due to building limitations in the area. Lifts offer much reduced station access compared to escalators which move larger numbers of people more quickly between etrance and platform. The old station finds itself inadequate to cope with the demand it faces from tourists visiting the Covent Garden Piazza and Market, especially at weekends and in summertime. Until recently the station became exit only at weekends to cope with this demand spike. New lifts have eased this. Leicester Square is not too far away, so returning passengers were directed to walk the 260m to the next station. Incidentally this is the shortest interstation distance on the London Underground network. TfL hope to install a new exit to the station which will help even more. 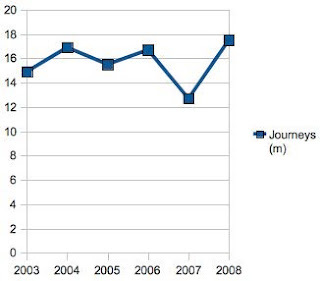 Passenger journeys (entries and exits) at Covent garden tube station in recent years. This may be enough to increase the station's capacity. There is another possibility, from an unlikely direction. The DLR, Docklands Light Railway has been expanding apace in recent years. New links to Stratford iand Dagenham Dock are due to open soon and one of the next projects in the pipeline is an extension from Bank to Charing Cross in the heart of the West End. It has even been suggested it might continue on to Victoria! Well, it could be said the DLR stopped being a light railway with the introduction of three car trains. Perhaps it's not a Docklands railway any more either. 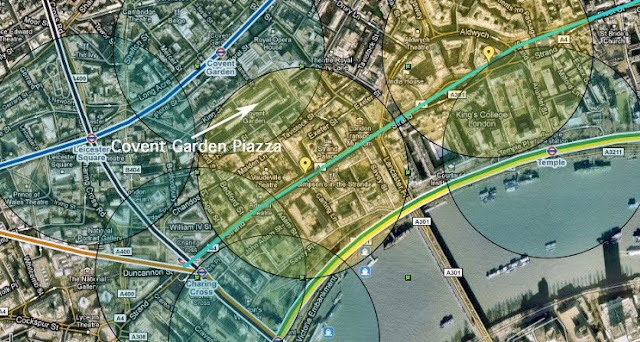 The extension would make use of the old Jubilee Line tunnels which overran from Charing Cross along the Strand as far as Fleet Street, part of the planned 'Fleet Line' which did not transpire. In the end the line terminated at Charing Cross. The tunnels, if used, would require enlargement to DLR guage. Passing along the Strand as it would, the line presents us with an interesting opportunity. 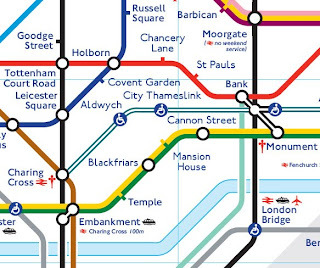 How the DLR extension to Charing Cross might look on the Tube Map. In this form it would do nothing to help Covent Garden. It has been mooted that the line provide interchange at City Thameslink (sensibly) and also a station at the site of Aldwych station (terminus of a Piccadilly Line branch line from Holborn, now closed). However, it would be possible to provide a station in addition to, or instead of Aldwych, further down the Strand opposite Southampton Row. This would be very close to Covent Garden Piazza (about 200m) and be almost as useful to the area as the current Covent Garden station. The map below indicates 300m radius catchments of the stations in the vicinity, existing and potential. Station catchments around Covent Garden. Strand DLR station (at centre) would provide an excellent alternative to Covent Garden. Naming the station "Strand (Covent Garden)" or somesuch would encourage the tourist, unfamiliar with London, to use the station as a Convent Garden alternative. In effect it fulfills the function of a Covent Garden station expansion. The big problem is that the unused Jubilee Line tunnels from Green Park to Charing Cross & almost Aldwych would would require enlargement to DLR guage. That's 100s of millions of pounds. Why not use the unused Jubilee tunnels for a new tube line, west from Green Park to Victoria & on south, and east to Aldwych, City Thameslink, Cannon Street, & onwards. It could go south to serve south London, and possibly east to Docklands as a relief to the already overcrowded JLE. Fleet Line pre-planning resulted in some works already built at City Thameslink & Cannon Street for a tube line. A station is not needed at Green Park (though provision for a future station may be desired). Aldwych station can be reopened, included the never opened portions. As building stations is the major expense of new transit lines, this would save over 100M pounds.